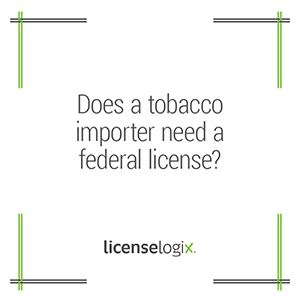 If your company intends to import tobacco products within the United States, you may be required to obtain a federal permit through the Alcohol and Tobacco Tax and Trade Bureau (TTB) before engaging in such business. Additional wholesale or retail tobacco licenses may be required by state and local authorities depending on where the tobacco will be sold. Federal law requires all businesses that import tobacco products that are not for personal use or consumption to obtain an Importer of Tobacco Products permit. In order to apply for a permit, you must complete a detailed application, a personnel questionnaire for each officer, director, or stockholder of more than 10 percent, show proof of source of funds for the business, provide a copy of contact or letter of intent from foreign supplier, and obtain a surety bond. Failure to secure and maintain proper licensing could potentially incur civil fines, or the imposition of criminal penalties.